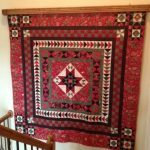 Handcrafted Quilt Displays, Racks, Shelves, Stands, Ladders and Display Cabinets. DWR Custom Woodworking is owned by David Reiner. and needed some cabinets and stands for his dorm room. wall clocks, furniture for his house and children but decided the woodworking machines he had, needed to be upgraded. With limited funds for machines the idea of a woodworking business was born. As with many small businesses, DWR Custom Woodworking was started in his home basement. 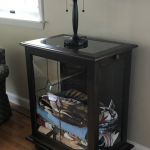 Dave started to design and produce a line of home interior accent items for designers and furniture stores. 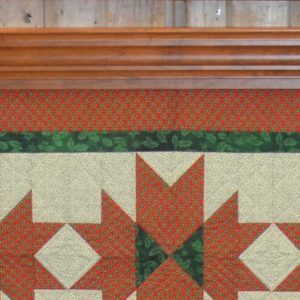 After about 12 years of providing high quality interior accents and shelving, DWR Custom Woodworking reinvented the product line in 1996 and introduced a new product, a line of quilt hanging products. 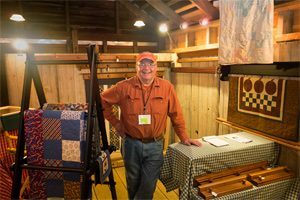 Soon after, he discovered his first quilt show. 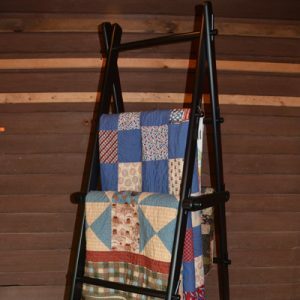 DWR Custom Woodworking has been providing the highest quality quilt display products since and with the help of quilters who provide Dave with inspiration and ideas, DWR Custom Woodworking has added new items to the product line of quilt display products on a regular basis. 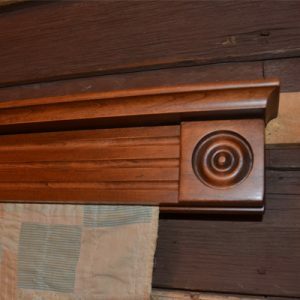 DWR Custom Woodworking has since moved from his home basement and currently has 2800 sq ft woodworking shop near his home in Bucks County, PA. I just wanted to send you photos of the quilt hanger going up. My husband and 2 sons installed it while the grandkids and I walked to the playground. Thanks for building my beautiful new piece of furniture. Hi David, The quilt ladder arrived today – awesome packing job & perfect color. A check is on its way to you. Thanks again for the beautiful work! Hi Dave, The Apple ladder went together flawlessly, even doing it by myself! I appreciate that you had instructions tucked into the bag with the pins. The ladder fits perfectly in the space I had reserved for it, and the color combination looks great. 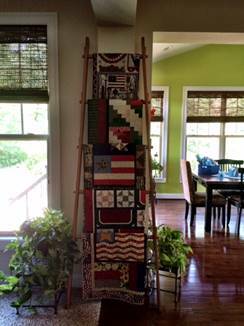 I attached a picture of the ladder, already displaying a few quilts… now I need to create a few more quilts with red/greens & browns to fit the room! (There’s always room for another project! )Thanks for the special delivery, and I’m very happy with your product! Thanks, Dave, we love the quilt rack. Your workmanship is beautiful. The stepladder just arrived. It went together perfectly. Thank you so much. It is so well made and beautiful. My ladders arrived today!! Thank you! My husband said you are a master packager lol! Thanks so MUCH!!! My racks have arrived and are just beautiful!! Will definitely recommend others to you. Hi David-The ladder arrived and I’ve assembled it! It’s beautiful and I’m so very pleased with the workmanship. I have some Shaker style furniture and the ladder fits in perfectly. Hi, Just to let you know that the rack was delivered to the Hotel the same day we arrived. Arrived back home yesterday and unpacked it to find it beautiful and in good shape. Thanks again. Much appreciated. I received the shelf today. Looks great.. Thanks! David, Got the cabinet out of the crate last night…..masterful packing! It is beautiful and my wife LOVES IT!!!! You are truly a master craftsman! Thank you. Got my ladder today and it looks great! Thanks. 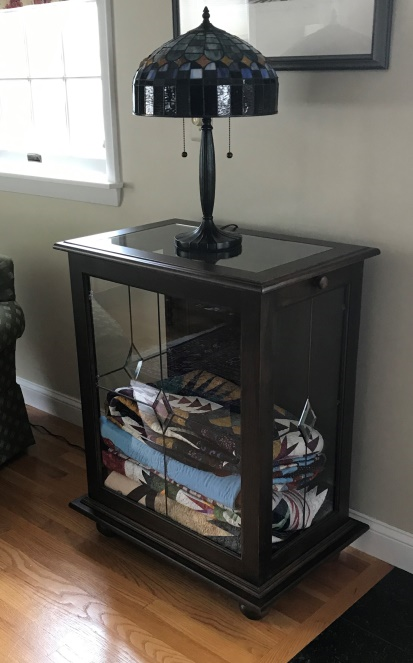 Hi Dave – I wanted to send pictures of our beautiful quilt cabinet. It made it to our house safely with no problems and we both just love everything about it!! Thank you David. I love it. You do nice work! The quilt hanger arrived today as scheduled. Took me a while to unpack your work and its certainly very attractive. Now its up to me to finish the job and get the quilt hung properly. 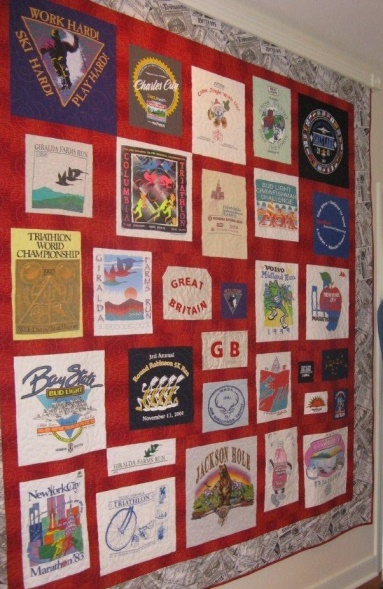 Its going to be an attractive and unusual addition to my house and a real talking point since the quilt is made up of some of my many running and triathlon shirts. Some of the events covered are world famous. Thank you again for such nice work. I have been remiss in sending you a note to let you know that the ladder arrived in perfect condition extremely well packed. My husband was able to follow your directions and put the ladder together in a short amount of time. 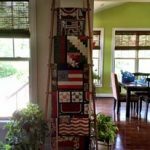 I purchased a hanging quilt rack some years ago from you at a show. Very satisfied with the product. 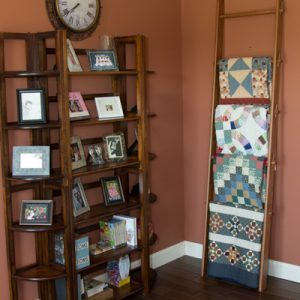 Looking to make another purchase; possibly a quilt ladder. Just to let you know that the ladder has arrived and although we have not assembled it yet, all seems to be in good order and your work is beautiful. Thank you. I got it! It’s beautiful!! Thanks ever so much!! Thank you Dave. 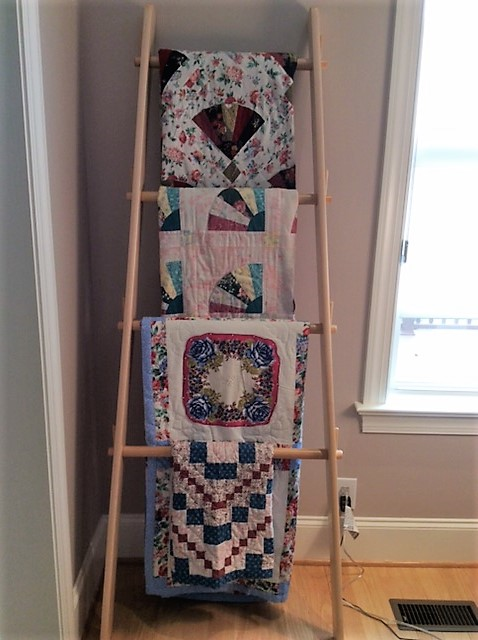 The quilt rack is beautiful. Hi Dave, it arrived and is just beautiful, thank you!! 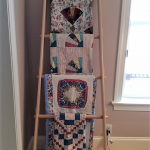 Hi Dave – the quilt rack arrived safely today. It is beautiful! Good Morning Dave. Love quilt hanger. Perfect color! Thank you so much. !! Thanks Dave! I received the hanger. It’s perfect. Just a note to let you know my quilt shelf arrived safe and sound. I can’t thank you enough for the great job you did. The workmanship is wonderful and I couldn’t be happier with this shelf, it’s beautiful. I was also really impressed with how it was packed for shipping- there was no way that shelf was going to get damaged! 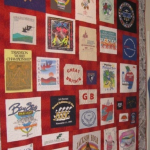 Thanks and we will certainly be ordering again- I have some more quilts that I need to display. 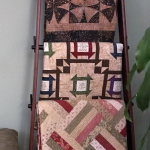 Back in November 2013 I ordered a QUILT LADDER from you . We were very pleased with it and I WOULD LIKE TO ORDER ANOTHER ONE JUST LIKE THE ONE YOU SENT. The ladder arrived on Friday just as I was leaving for work. My husband put it together this afternoon and I am very pleased. 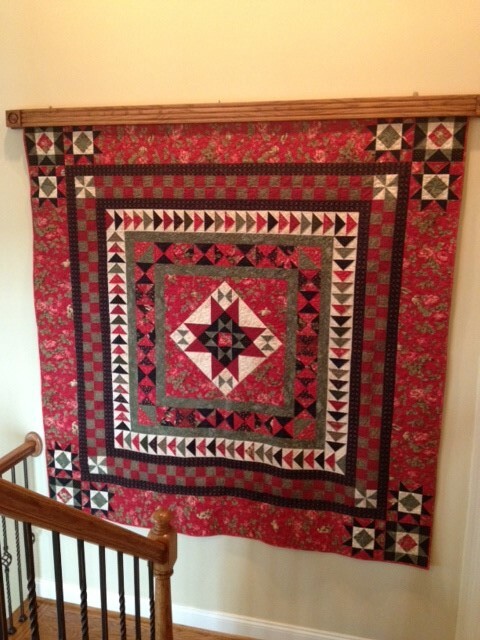 The workmanship is truly wonderful and I will enjoy using it to display my quilts for years to come.